China is planning more supercomputers with homegrown chips in order to meet government demands, according to a Chinese researcher involved in the country's high performance computing. Last month, China's National Supercomputer Center in Jinan unveiled the Sunway BlueLight, the country's first supercomputer based entirely on domestically- developed microprocessors. The Sunway BlueLight has a sustained performance of 0.79 petaflops (quadrillion floating-point calculations per second) when measured with the Linpack benchmark, which could place it at number 13 in the world's top 500 supercomputing list. Over the next five years, China is expected to develop more supercomputers using homegrown chips, said Pan Jingshan, an assistant director at the National Supercomputer Center in Jinan. In 2006, government authorities outlined the country's future scientific development plans, which called for research in petaflop supercomputers built with "new foundational concepts". 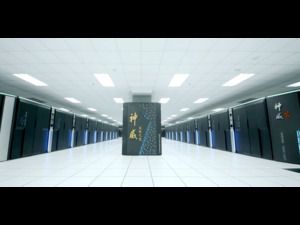 Part of the center's goal in building the supercomputer was to raise China's technological competitiveness, Pan said. "Building supercomputers is the result from China and the local government's requirements. There definitely will appear more supercomputers using domestic CPUs," he said. The Sunway BlueLight uses 8,704 "Shenwei 1600" microprocessors, giving the supercomputer a theoretical peak speed of 1.07 petaflops. The Sunway BlueLight has a power consumption of 1 megawatt. Pan, however, did not have details on the microprocessors used. Other computer scientists involved with its construction were also contacted, but could not be reached for comment. Photos and reports from local Chinese press, however, show designs of the Shenwei 1600 microprocessor. According to the photos, the chips are built with 16 cores, and have a clock speed from 0.975 to 1.2 GHz. The chips also use a RISC (reduced instruction set computing) architecture. Photos can be found here. Jack Dongarra, a computer scientist at the University of Tennessee who also compiles the top 500 supercomputing list, noted that the Shenwei 1600 chip was built with a 65 nano-meter design process. "The design is world class," he said in an e-mail. "Putting 16 cores, at low power, in a 65 nanometer design is very good." In comparison, Intel's Core i7-900 chip series use a 32 nanometer design process, giving it four times the number of transistors, he said. "For such a critical technology as computer chips I would guess that the Chinese would not like to be dependent on Western technology, just as the U.S. would not like to be dependent on foreign technology," Dongarra said. This month, a Chinese computing association released its own list for the top supercomputers in the country. The Sunway BlueLight took second place, putting it behind the Tianhe-1A, which briefly grabbed the top spot for world's fastest supercomputer in 2010.